Taking on a good challenge is something I’ve always respected. In the modern hospital kitchen, specifically ours, every day can bring a new opportunity for a challenge. But there are different degrees of difficulty when it comes to improving the food in your facility. Additionally, often challenges are accepted because the person being challenged knows that it will be easy, so they accept & conquer. Take for example the recent ALS Ice Bucket Challenge, is it really a challenge, or is more of an opportunity to raise money and heighten awareness? Dumping ice water on my head in the middle of summer isn’t exactly a challenge to me. But some challenges are just that, a true challenge. Something that you know may be a difficult task, but if you put forth the effort and work, you will have a chance to come out on top. In the hospital kitchen, I get a tremendous amount joy out of seeing somebody from our culinary team rise to a challenge. It happens often, but this is one of the more memorable examples. So let’s talk pizza. It all started a few months back, as we were expecting some increased retail volume due to a hospital wide computer transformation project, we had to make changes to our daily culinary routine. We decided as a team, that due to higher anticipated volumes, we needed to speed up our service at every level. One of the focuses was on our pizza station. We made the difficult decision to outsource our pizza during the one month time period. This would enable us to keep up with the volume of additional customers. So we hit the streets of Raleigh, and found a place with arguably the best pizza in town. Randy’s Pizza has seven locations in North Carolina. 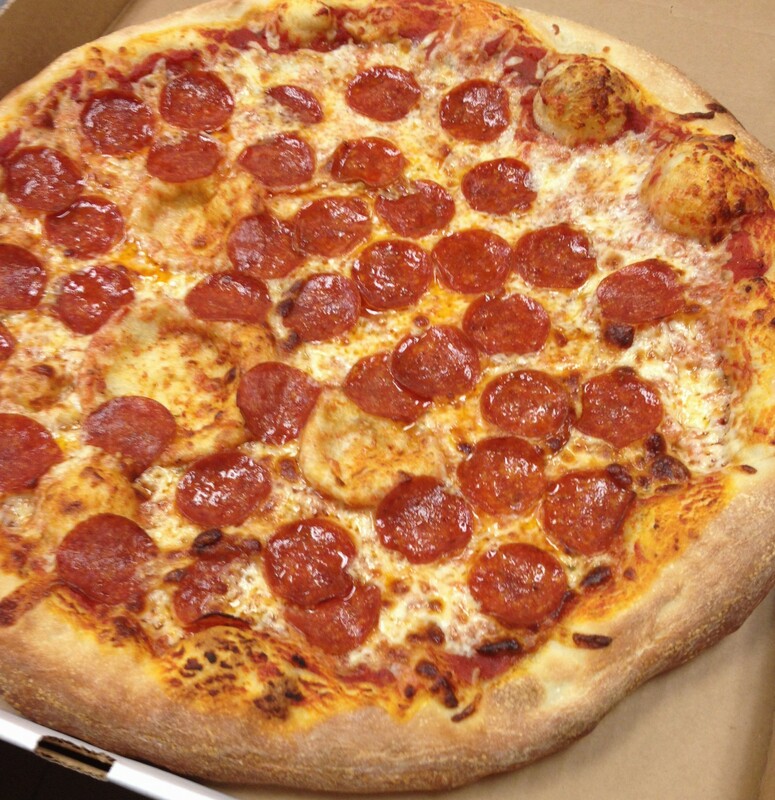 Their pizza is great, and was recently awarded Best Pizza in Raleigh 2014! For our customers, it was such a treat to have Randy’s NY Style Pizza delivered here fresh out of the oven; multiple times daily. Weeks later when the rush was over, our Director didn’t want to go back to our pizza that was being served prior. Was it quality? Yes. Where we proud of it? No. When looking at reinventing it, we wanted our pizza to be comparable to Randy’s. It would be challenging to pull off. More daily effort, training, and production would be needed. In other words, it would be a considerable amount of more work! Enter Steve Pexton. Our very own Chef Steve Pexton accepted this challenge and decided to take it to a whole new level. Steve saw a challenge, and was ready to conquer. After about a week of recipe development, Steve had redirected our ship. 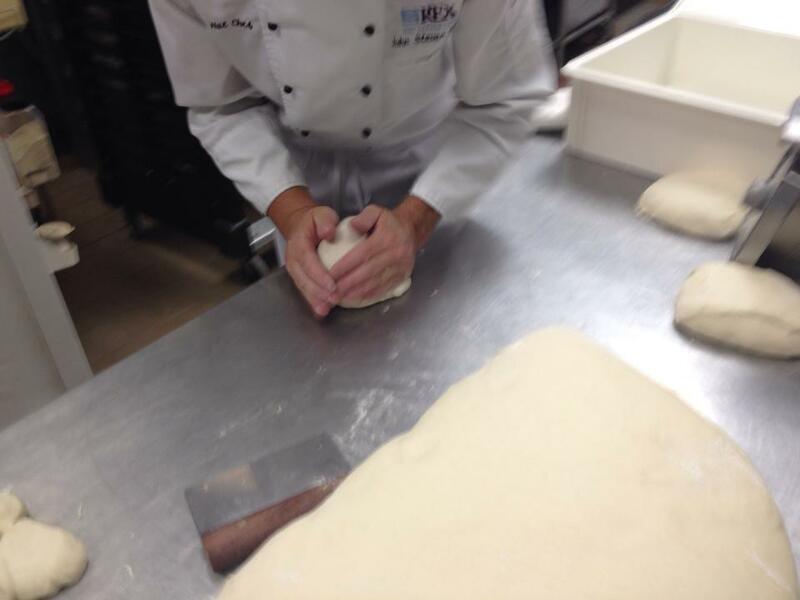 His mission started with making our own dough daily, from scratch. Every day in the mid afternoon, our Hobart mixture is jingling in back prep room, and our very own homemade pizza dough is being tossed around gently by the dough hook. It is after resting the dough, Steve and his team carefully measure, and form the dough into balls and proof them overnight in a dough box- just like a pizza shop in New York. The next day that dough is hand stretched and topped with our sauce. This pizza sauce is robust, consisting of nothing more than the highest quality San Marzano Tomatoes, basil and kosher salt. I once again thank my longtime friend Jason O’Toole, chef owner of Pizza Barbone, in Hyannis, Massachusetts for sharing with us his expertise on the sauce. Just like at your local pizza joint, our pies are now baked just as we need them, and rival the quality and taste of any pizza place in town. More importantly though, Chef Steve has risen to, and conquered the pizza challenge. He has not only developed our new program, but has trained other members of the team so we have a consistent product, a new pizza program that we are all very proud of! His team is following out his vision to have an authentic pizza built from scratch right from the hospital kitchen. To our new friends at Randy’s, well thanks to Chef Steve, you now have some friendly competition right up the street. That’s whats up! This entry was posted in food, Uncategorized and tagged Black Hat Chefs, hospital food, pizza. Bookmark the permalink.